Spicy, saucy, fragrant Cuban-style camarones enchilados (or deviled shrimp, or shrimp creole) served over rice. Perfect for special occasions or weeknight meals! In 1975, my mom bought a Cuban paperback cookbook. She had only been living in Miami for less than 5 years and didn’t even have a car! She had walked to a nearby pharmacy and picked up this little gem. This cookbook had a BUNCH of recipes from her childhood and our Cuban heritage. We’re talking vintage here. This book is now in SHREDS. I now have the cookbook taped up in my kitchen! Here’s a photo of what it looks like today. Every year for Easter Sunday, while other families are making ham and deviled eggs, my mom makes camarones enchilados. She makes this every year with white rice. It has become an annual tradition! Camarones enchilados is loosely translated to spicy shrimp. There are several variations of camarones enchilados and different names for it too – deviled shrimp, shrimp creole, camarones a la diabla. Bottom line: It’s DELICIOUS. This recipe below is for deviled shrimp made Cuban-style from my mom’s 1975 Cuban cookbook. First, you sauté the onions and garlic in a Dutch oven with a little bit of oil. Throw in the shrimp and sauté for 2 minutes. Careful not to overcook the shrimp. No one likes chewy shrimp. Add pimentos, bay leaf, parsley, tomato sauce, wine (or stock), vinegar, salt and pepper. Cook for 20 minutes. That’s it! Personally, I think it’s best served over rice. The rice soaks up the sauce and it’s just OH SO GOOD. Sometimes, we’ve serve it over jasmine rice or just plain white rice. I hope you make this and you LOVE it! In a dutch oven or large pot, heat olive oil over medium heat. Add onions, green peppers and garlic. Sauté for 2 minutes. Stir in tomato sauce, wine (or stock), vinegar, pimientos, bay leaf, parsley, oregano, salt and pepper. Bring to a boil then cover. Reduce heat to low and simmer for 15 minutes. 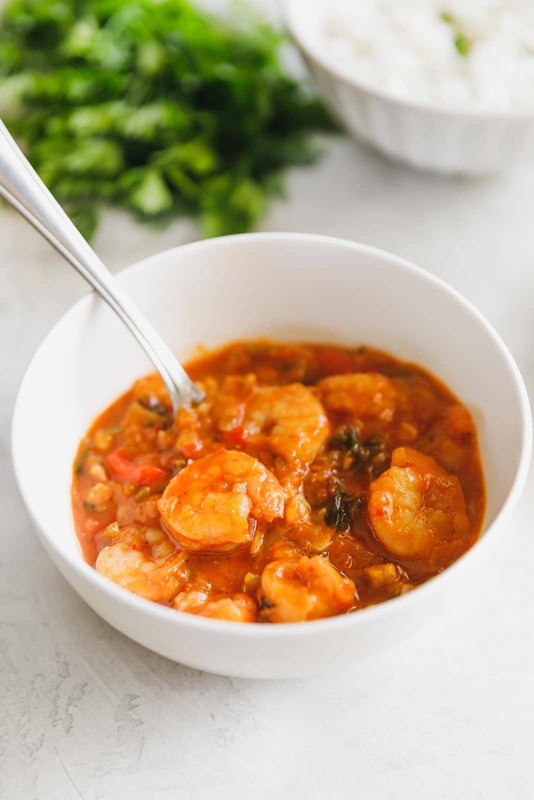 Add shrimp and cook for 3-4 minutes, stirring occasionally until they are fully cooked. Serve over rice or with veggies. Enjoy! All images and text ©A Sassy Spoon. Did you make the recipe? Be sure to post + tag @asassyspoon on Instagram and use #asassyspoon! This looks amazing especially over that white fluffy rice! I’m a rice hoochie, I could have rice everyday :) Yum!! It’s the Latin in us, my friend! We love rice! I love a meal that’s flavorful but ready in minutes and this fits the bill! I’m always making shrimp with garlic butter and it’s about time I branched out. I love the bite of the pimentos in there and it looks perfectly saucy! Hooray for branching out! Hope you love it, Alison! 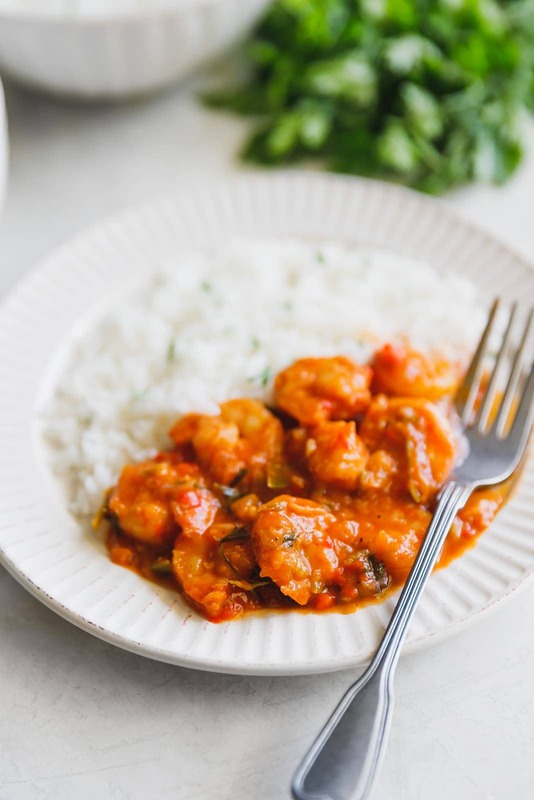 This spicy saucy shrimp looks amazing and serving it with rice to soak up the sauce?! Yes please! Pinning this! That’s an awesome tidbit about the cookbook! I have some old cookbooks that my dad gave me (some of them were handwritten by my great grandmother) and I love flipping through them! It just shows how timeless food is. I’ll have to put some of my favorites on the blog at some point. 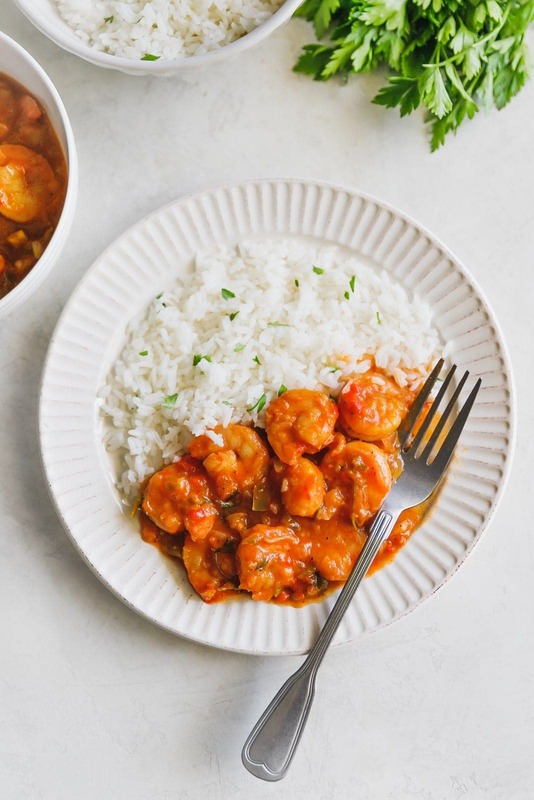 :) In the meantime, this shrimp recipe looks delicious! Love the look of the sauce. Thanks for sharing! Yum! I love all things spicy and these deviled shrimp sound perfect! Definitely making this soon, thank you! 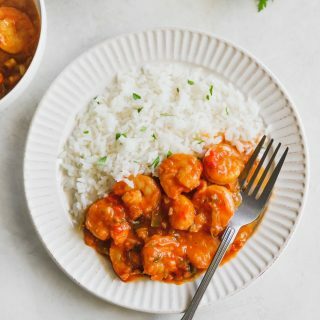 The best way to make these are making the suave with the shrimp in advance so that the shrimp are embedded with the rich flavors? nonetheless, amazing recipe ?? So glad you like our homeland food! You can substitute shrimps for lobster, scallops or even that cheap mixture of seafood they have in most supermarkets. Add maduros or chatinos (Cuban word for tostones ) and you are set. Get your mom to give a recipe for making conk fritters as an appetizer to this. Love this! Being cuban I can say this is very authentic. Goes perfectly with some fried plantains! Thank you.